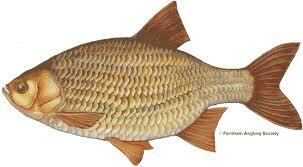 Physically, the rudd and the roach are very alike, although the rudd is slimmer in cross-section. It has a characteristic angled 'keel' between its vent and tail root, and the dorsal fin is set further back than the roach. The mouth is up-turned and herring-like, with the bottom jaw protruding upwards, used for surface feeding and catching falling food particles.